Should My Countertops and Backsplash Match? It can be a daunting task to coordinate all of the colors, materials, textures, and patterns involved in a room makeover. Some find it so overwhelming or difficult that they may hire a designer or buy everything from a showroom kitchen that they like. 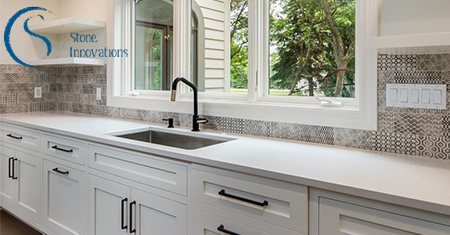 We have a few pointers to send you in the right direction when it comes to choosing the countertop and perfect backsplash to compliment it. We won’t judge if you do if entirely your own way. Our first recommendation is to choose the countertop first. It takes a lot of space and abuse, and is not so easily switched out. A mostly neutral color is probably the way to go, especially if you may want to resell later. Pink might be your favorite color now, but a bathroom or kitchen (*gasp*) full of pink marble could be a deal-breaker for the next potential owner. Not to mention, you might get pretty tired of seeing it yourself. Consider the elements already in place. If you are working around flooring and cabinets that aren’t changing, consider the style. If you have stainless steel appliances, that bead board backsplash probably won’t fit the style of the kitchen. Use opposite colors: Choose a white tile backsplash with a grey countertop. Use the grey as the grout color in your backsplash. Busy colors and patterns with plain: try a graphic or multi-colored backsplash with a plain colored countertop. Or a textured backsplash with smooth counter. Use the accent color: If the countertop has flecks or veins of a different color, use that accent color as your backsplash. Green veins in marble matched with a green glass backsplash is a winning combination. Pick one of many: If your backsplash consists of a mosaic of different colored tiles, for example, choose one of those featured colors to be your countertop color. Make them match: Go ahead and break the rules. Using all white, for example, can make a stunning room. An accent should still be brought in with colorful appliances, dishes, or pictures. See it the room. This can be a big investment. Don’t necessarily trust the fluorescent lighting at the store. Take all the samples home together and view them in the room where they will stay after installation. How do they look in your light with all of your other décor? These tips will hopefully find you feeling more confident and less stressed when choosing how to complete the room of your dreams.